I wish I could be super-organised in the mornings and get up as soon as the alarm sounds, but that rarely happens for me. Usually I’m racing against the clock and subsequently looking for a quick but nutritious breakfast before I leave the flat; let’s be honest, the one thing (and probably the only thing) that breakfast cereals have going for them is their convenience and speed, but certainly not their nutritional value! Recently I’ve been too reliant upon eggs for breakfast so I have resolved to be a bit more creative with my morning cooking whilst still keeping within the tight time constraints that most of us are limited by. 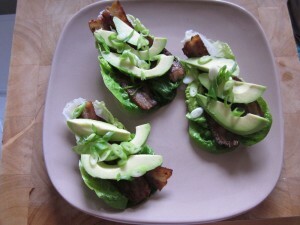 So today’s breakfast paired the classic combination of bacon & avocado! I don’t know exactly why these two work together so well, maybe it’s that opposites attract; creamy, soft avocado set against crisp, salty bacon but it certainly works for me. The recipe is as simple as it gets; firstly fry off your bacon, I just let the bacon cook in it’s own fat, turning it occasionally until it is nice and crispy. Then arrange some washed little gem lettuce leaves on a plate and place the cooked bacon on top. Finally, arrange some sliced avocado on that and finish it off with a few sliced spring onions. All finished in a matter of minutes & truly delicious, I only wish I had some fermented ketchup in the fridge to finish it off – I think that will be my next job! If you have any quick-and-easy Paleo breakfast recipes please let me know in the comments section below. Happy eating! 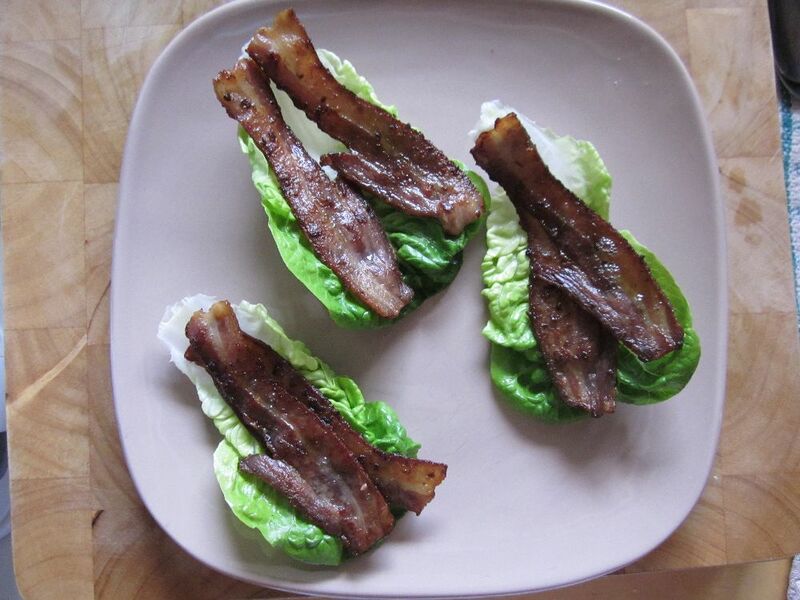 Crispy bacon on lettuce, I can’t think of a much better sight! It get’s better with avocado & spring onions on top, it’s just missing some fermented ketchup though. 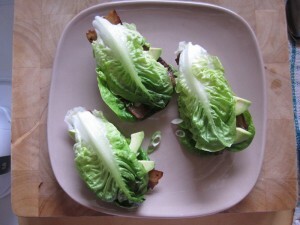 Another lettuce leaf makes the whole thing so much easier to eat. Hmmmm, looks great, will give it a shot. Who needs bread eh! Had it this morning before my morning Movnat session, Beautiful. Quicker still if the bacon is cooked the night before…! Leave a Reply to Neil Massey Click here to cancel reply.